If you’re sitting down to roast turkey for Christmas dinner give a thought to the turkey’s wild relatives and the habitats they depend on. The turkey that we eat at Christmas in the UK originates from a southern Mexican subspecies (Meleagris gallopavo gallopavo) and has been on our tables since the 16th century. It was introduced into Europe by way of one of Sebastian Cabot’s officers on a return journey from the New World: transported from Mexico to the Spanish Netherlands by Spanish traders, and then on to England. The name ‘turkey’ probably came about due to the domestication of birds imported into Britain in ships coming from the Levant via Spain. The British at the time associated these birds with the country Turkey and the name stuck. Once in the UK these exotic birds were an instant success with the upper classes. Before turkey took over, the popular Christmas delicacies were bustard (now extinct in the UK although the subject of a reintroduction programme) goose and capon, and in rich houses peacock and swan. So successful was their domestication that English settlers actually took them back to America with them as farm stock. Although the USA has a population of wild turkeys (Meleagris gallopavo) approaching seven million birds, for the Mexican subspecies it is a different story. The wild turkey was once common in the mountains of Mexico but has teetered on the brink of extinction. However, with protection numbers are gradually increasing. 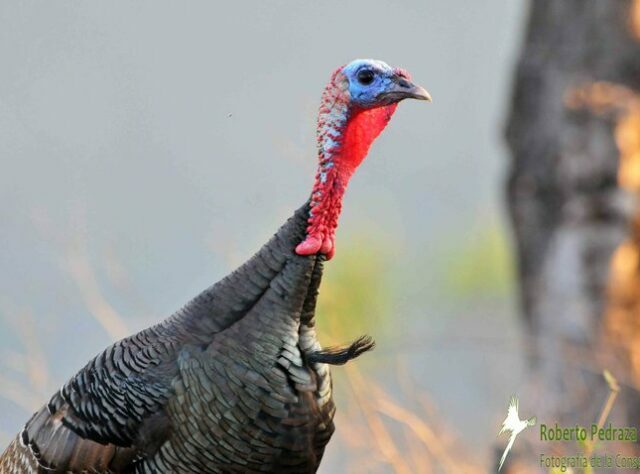 The Mexican Wild Turkey pictured was photographed by Roberto Pedraza near to El Jagueycito Reserve, which is supported by World Land Trust (WLT). It is possibly the first photographic record of this species in Querétaro state. Thanks to the land purchase and protection work carried out in the mountains of Sierra Gorda by Grupo Ecológico Sierra Gorda (GESG), WLT’s conservation partner in Mexico, the Mexican Wild Turkey now has a future in the wild. The Ocellated Turkey (Meleagris ocellata) differs from other species of wild turkeys in North America and is easily distinguished from its cousins by its spectacular colouring. This species only exists in a 50,000 square mile area of the Yucatan Peninsula in Mexico, Guatemala, and Belize and is now rare. The Ocellated Turkey, called Cutz and eaten by the Maya, is hunted for sport bird and consequently faces tremendous pressure. It has never been domesticated although it is now reared in captivity as a food bird. The good news is that the Ocellated Turkey is faring well in forests managed by Programme for Belize, WLT’s Belizean conservation partner. The species is commonly seen around the La Milpa Field station in the Rio Bravo Conservation and Management Area, which is supported by WLT. The Ocellated Turkey was the subject of a WLT Christmas Card many years ago. You can help conserve the Mexican Wild Turkeys of Sierra Gorda by donating to WLT’s Buy an Acre and specifying Mexico in the comments box.